Welcome to the Garage at 100 Clarendon – Back Bay and South End’s most affordable and conveniently located parking facility. Positioned above the Massachusetts Turnpike and next door to Back Bay Rail Station for both the MBTA and Amtrak, this full service parking facility offers flexible parking programs with unmatched customer service. Discounted rates for area businesses and attractions. 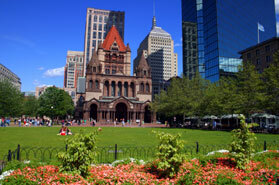 Are you hosting an event in the Back Bay/South End? Find out about our event parking program. Loaner Umbrellas, and Driver Assistance Services. Car care services for while you work, dine, or shop. Special pricing for area arts. © all rights reserved Boston Properties, Inc.